Tag line: "A winter wonderland becomes a nightmare of destruction!" 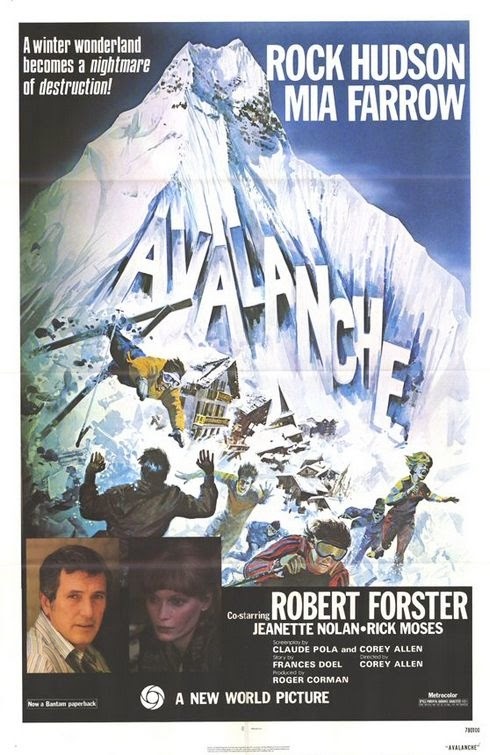 1978’s Avalanche was producer Roger Corman’s attempt to cash in on the ‘70s disaster craze, and while he definitely deserves an “A” for effort, I can’t, in good conscience, give him a passing grade for the rest of the film. Entrepreneur David Shelby (Rick Hudson) is preparing to celebrate the grand opening of his lavish ski resort, and has invited star athletes to compete in a series of games he’s hoping will kick things off on the right foot. Alas, not everyone is happy to see the resort open its doors. For one, environmentalists have attacked Shelby for destroying the area’s natural landscape; and wildlife photographer Nick Thorne (Robert Forster) warns of the possibility of a catastrophic avalanche, due mostly to the snow gathering on a nearby mountain. To top it all off, the government is investigating Shelby’s business practices, and he’s ordered his lawyer (X Brands) to fly in ASAP so they can review the case against him. These issues aside, Shelby is looking forward to a fun-filled weekend, as well as the chance to get re-acquainted with his ex-wife Caroline (Mia Farrow), who he still loves. Soon after the games commence, tragedy strikes: the plane carrying Shelby’s lawyer crashes high atop the mountain, causing an avalanche. With both the games and the lodge directly in its path, this avalanche barrels downward, burying everyone standing in its way under several feet of snow. How many will survive this terrible ordeal? Like The Towering Inferno and The Poseidon Adventure, Avalanche boasts a plethora of characters, all living out their own little dramas (infidelities, loneliness, fierce competitions, etc) in the days before the disaster strikes. Where it differed from the others, however, is that, aside from Farrow, Hudson, and Forster, Avalanche doesn’t feature an all-star cast, which made it difficult to keep track of everyone (The Towering Inferno followed a large number of people as well, but with the likes of Paul Newman, Steve McQueen, William Holden, Faye Dunaway, Fred Astaire, O.J. Simpson, and other well-known stars in the cast, it was easy to remember who played what character). And because I had a hard time figuring out who’s who, I didn’t particularly care about the characters' various troubles (a love triangle between a married woman, a champion skier and a world-class figure skater went nowhere). As for the avalanche itself, the special effects were noticeably shoddy (the superimposed snow rolling down the hill wasn’t convincing at all), which kinda took the edge off things.